Will Kmart’s New “Ship My Pants Ad” Help Revitalize The Brand? Kmart was founded in 1962 by the SS Kresge Corporation in Michigan. 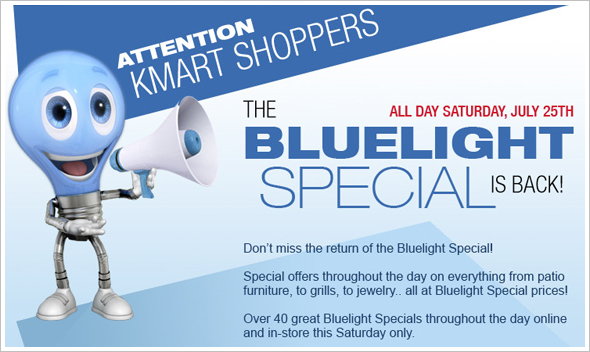 Kmart became known for its “Blue Light Specials.” They occurred at surprise moments when a store worker would light up a mobile police light and offer a discount in a specific department of the store. At the height of Kmart’s popularity, the phrase “attention Kmart shoppers” also entered into the American pop psyche, appearing in films and other media such as Troop Beverly Hills, Six Days Seven Nights, Rain Man and Beetle Juice. In a world where rivals can match or exceed its price promise, Kmart’s Brand meaning has lost its relevance. Today, it seems impossible to believe that Sam Walton, once had Kmart envy. Walton used to tour Kmart stores and hold them up as an example of how to do everything right. For a time Kmart was the “King of the Hill” in retail. The mighty have fallen. Today the creator of the Blue Light Special is closing stores and fighting for its life in the chain-discount category that it helped to create. K-mart has struggled because they have failed to upgrade their stores and a lack of a clear brand positioning in consumer’s minds. They face difficult competition in a market dominated by Target and Wal-Mart. Until recently, nobody was talking about Kmart. In April, Kmart launched a new ad “Ship My Pants” online. The funny, edgy commercial promotes their online “Ship to Home Service”, which Kmart launched a year ago, offering customers free delivery on any item they can’t find in stores. The ad quickly went viral has generated over 16 million views on You Tube. The ad has brought much-needed attention to Kmart, but it also seems to point out that customers have been frustrated by the in-store experience. Kmart has under-invested in their stores for years. In my opinion, it is going to take Kmart more than a clever ad to become competitive. They need to identify a clear target segment, build a relevant positioning and improve the in-store experience. I question whether Kmart has a viable sustainable brand position. What do you think of Kmart’s long-term prospects?